Thanks to Andrey for writing in and showing us his Java based Meteor-M decoder for the RTL-SDR which he uses on a Raspberry Pi. The decoder is based on the meteor-m2-lrpt GNU Radio script and the meteor_decoder which he ported over to Java. Essentially what he's done is port over to Java a bunch of GNU Radio blocks as well as the meteor decoder. The ported Java blocks could also be useful for other projects that want to be cross platform or run without the need for GNU Radio to be installed. In his blog post (blog post is in Russian, use Google Translate for English) Andrey explains his motivation for writing the software which was that the Windows work flow with SDR# and LRPTofflineDecoder is quite convoluted and cannot be run headless on a Raspberry Pi. He then goes on to explain the decoding algorithm, and some code optimizations that he used in Java to speed up the decoding. Andrey notes that his Java version is almost 2x slower compared to the GNU Radio version, but still fast enough for real time demodulation. Meteor-M2 is a Russian weather satellite that operates in the 137 MHz weather satellite band. 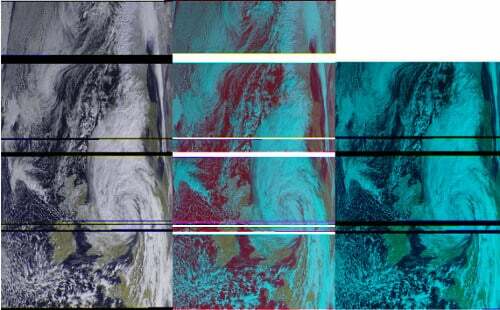 With an RTL-SDR and satellite antenna these images can be received. Running on a Raspberry Pi allows you to set up a permanent weather satellite station that will consistently download images as the satellite passes over. Images received with Andry's Meteor-M software running on a Raspberry Pi.